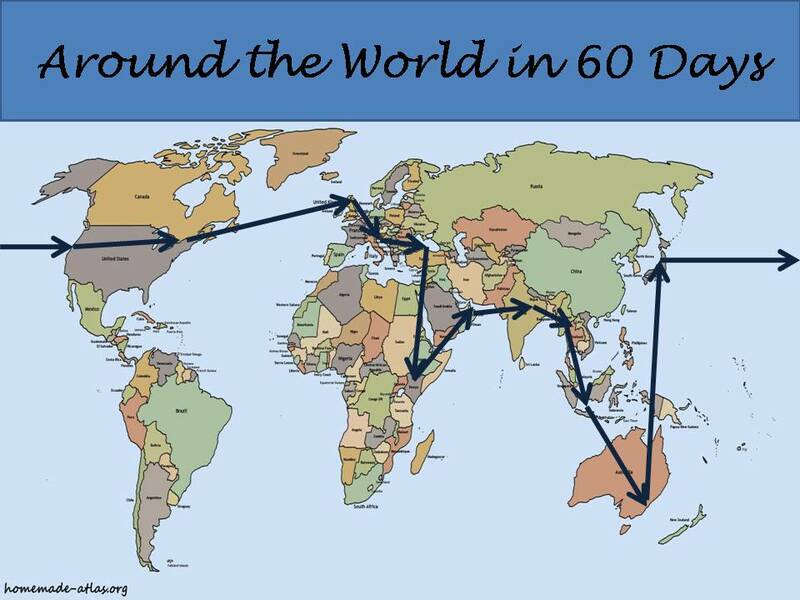 Around the world in 60 days !! Sometimes I think what would be the best way to express gratitude to my parents. They have been kind and obliging to accept a different child who more often than not neither asked or listened just went ahead. They nurtured the independent streak in me which helped me deal with every situation while I hopped from one country to another on work and travel. When I was growing up they took me to different parts of India to experience the different flavors of India through history, art, culture, nature and now that they are retired and reflecting on days gone by, and its my turn to take them on a trip that would make them happy. As luck would have it, I walked into a second hand book store one of these days and my gaze fell on Jules Verne’s “Around the World in 80 days” and voila the idea of a round trip around the world in 60 days with them took shape!! Well it could have been shorter or longer but keeping their age and all the travel in mind, I thought this would be just right. Itinerary Planning: 5 continents, 60 days, two retired people and one nomadic soul, sounds impossible is it. But the lure of following the sun around great architecture, modernity, quiet rivers, gurgling sea waves, golden deserts, meeting the wild in their backyard, seeing the world from a hot air balloon, experiencing the perfectionist culture and the one time power house of the world, stretching lady luck in casinos and last but not the least tasting local cuisine is far stronger than thinking of aches, pains and the local grocer. This would give us a lot of time to chat under the stars about our lives gone by and I will get an opportunity to be the parent and be ever grateful for having them in my life. Singapore: Asia’s pride to have amalgamated the best of East and West and my parents have often contemplated a short break in Singapore. Australia (Sydney, Melbourne): I love their way of loving and living life and the best place to take long walks along the beach and a hot air balloon ride to fly in the sky. USA(Los Angeles, Las Vegas, Grand Canyon, New York,Washington): There is so much to see and do in USA that no itinerary can do justice. I chose the places to show them the best of USA that I have seen, lived and experienced which I am sure they would like. I cannot wait to take a walk with them in Times Square. UK (London, Aberdeen, Edinburgh): I need to give them a break from adventurie and allow them to rest in familiarity and London is my choice for it often reminds of Kolkata where they belong. I am adding bits and parts of Scotland for I want them to experience what it is to watch the reflections of the clouds in Loch Ness. Italy (Rome and Venice): They have lived Rome and Venice through my eyes, listening in awe when I related my experiences. I remember them staying up with me when I struggled with my History lessons on the Roman Empire conveniently mixing up one Caesar with the other. After nearly 3 decades, I would love to sit in a Piazza, enjoying the finest of Italian food and listening to that Roman History lesson again. Turkey-Istanbul, Cappadocia: Europe transiting into Asia and creating an open air museum and naming it Turkey. The food, the music, the mediterranean weather is a perfect combination to charge the weary traveler. It was a tough choice between Greece and Turkey but I leaned towards Turkey since I know they would love the archaeology from all the museum visits during my growing up years. Kenya- Nairobi, Jungle Safari: I remember my father reading to me a series of books on the Jungles of Africa and for a while I used to think all that Africa had was jungles. No trip around the world would be complete without me taking him on a safari that he described to me so vividly day after day. UAE- Dubai: After all the zest for days as we hop from one country to another, the best way to end the trip is to nibble into delightful delicacies and watch the sunset on the golden desert. Travel Assistance: For all the travel documents and bookings specially getting a round the world ticket, I am thinking of referring to Yatra.com since I have had a great experience with them in the past. I only hope they don’t turn me away for suggesting a crazy itinerary. The aim is to see them happy so I keep pondering on the ingredients that leads to a happy traveler? Is it the sightseeing, the food, the good hotels and the comfortable transport that makes a happy traveler or is it appreciating the people of the land, their culture and food, going about places that make them proud and the tryst with nature that makes one happy!! Actually, happiness is a state of mind, of conscious awareness that allows us to embrace and accept everything during travel. Every happy traveler will recount at least one instance that led to a permanent shift of something deep within during their travel. So in my parents post retirement years I would love to take them around to meet some of the people who shared this earth with them, experience things that they only saw on television and come in touch with the inner child in them to experience true happiness. Most part of our lives we are caught in a situation where he have time but not money or we have the money but not the time and in some situations when we have both, we do not have health. At a point in time, when we are blessed with all 3, it just seems logical to take off. I know I will be brushed off as crazy when I propose this to my parents but will need to use all my negotiation and management skills to convince. Time will tell whether I was successful or not. Even if not the trip, I will enjoy the planning, the arm chair travelling and weaving stories of the travel to be and that am sure will bring in happy moments. Wonderful…Sangeeta I wish that your wish comes true. I really hope you get to do it soon. Would love to read your posts on this helluva trip. Liked the idea of a 60-day trip… but, , it is so difficult to execute. Yeah maybe in parts. All the best for your trip. Nothing like a road trip. A different take on the prompt. Liked it and all the best for the contest! Thanks Uma. I just felt happy writing it. Thanks Jairam. Whether it happens or not, I loved the itinerary planning. Quite a trip you have planned there!! So many beautiful places, some of them rank very high in my bucket list too!! Wow 🙂 I hope you have the best time with your parents .. 😀 and that you win the competition too. In love with every word you’ve written. Took me back to these placesn brought back such beautiful memories.. Sounds like a fabulous trip. You would be seeing a lot of the world and some very different cultures very quickly. Rest days would be essential every couple of weeks I think. Thanks Suzanne. This is a dream and even if 50% of it comes true, I will be happy !! !